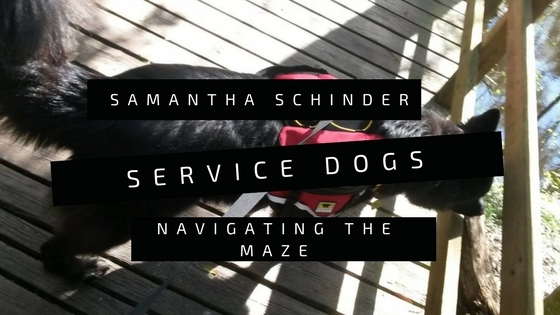 Helping you make heads and tails (pun intended) of the ins and outs of service dogs. The straight, no sales-pitch information. Service Dogs present an subject matter fraught with controversy. In a post OEF/OIF world, there are more and more veterans turning to service dogs to help cope with various disabilities. It is not just veterans that are realizing the vast array of services that dogs can be trained to perform. Dogs can be trained to detect low blood sugar in diabetics, a seizure before it happens, to protect those with anxiety disorders, to navigate crowds for those with Post Traumatic Stress Disorder, to detect forms of cancer and infections, to assist with mobility issues, the classic guiding the blind, and many other tasks. Contrary to popular belief, there is no one central service dog registry. That being said, it is very difficult to provide statistics on the numbers and types of service dogs in the United States. Some organization make guesses in the several hundred thousands, but these numbers are not based upon any really measurable criteria. When looking at anything from a legal perspective, one must consider things from federal, state, and local levels. For the purposes of this article, the federal law will be discussed. In most cases the state laws mirror and support the federal laws, without adding excess restrictions. They may add penalties such as a misdemeanor for breaching their guidelines. Most local areas do not have service dog specific laws at the community level. The Americans with Disabilities Act (ADA) (2010) governs most of the aspects of service animals in the United States on the federal level. Miniature horses are the only other animal allowed service animal status, although they have more rigidity in their access guidelines than dogs do. Service dogs are allowed wherever their handlers with a disability go- this includes restaurants, medical facilities, grocery stores, and other places of business. It is usually not recommended to take service animals to the zoo, however. The animals in captivity can have extreme reactions to the sight of the service animal and the experience itself can be slightly traumatic for the service dog as well, as it is exposed to extremely large predators in close range. How does Sammy the Dog Trainer know this?.....maybe from experience (oops). Aquariums are usually fine. 1. Is this dog trained to assist you with a disability? 2. What tasks is the dog trained to perform? They cannot ask you for a demonstration. They cannot ask you what your disability is or any questions about the extent of your disability. They can only deny you entrance IF your dog is not under control. They cannot require documentation, a badge, a certificate, or a license. From a business owner's perspective, there is not much one can do other than exercise the control clause, to deny entry to someone with a service animal to a business. Many business owners are not educated in what they can and cannot allow and many get away with denying entry. Hospitals tend to be the biggest culprit in this. Hospitals are required to make every effort to keep a service animal with a handler. There are some legal restrictions though. Some may require a bath within 24-48 hours of a dog visiting a hospital facility. This is due to the amount of germs and pathogens that can collect in dog fur. Some levels of the hospital will be off limits due to the infection risk from the service animal's fur. More and more, business owners are calling for stricter service animal laws due to the influx of impostor service dogs in their communities. The ACAA is stricter in some ways and more open in others. For instance, the airlines can require documentation from a healthcare or other service provider stating that the animal is a service animal or emotional support animal. This is IF your verbal responses to inquiries are not sufficient in satisfying the airline's assessment that the animal is not a pet. The airline can require the letter be within a certain date, usually no less restrictive than a year. But they DO allow emotional support animals, whereas the ADA does not afford them the same rights and privileges in other venues. Brennan and Nguyen (2017) provide a good online booklet summarizing the rights and responsibilities for both service animals and emotional support animals. It is always a good idea to have identification for your dog, if just to avoid hassle at the airport. I would recommend just obtaining a letter from your physician or mental healthcare provider before planning to travel, also to avoid hassle. Call the airline ahead of time to let them know you are bringing a service animal. This is especially important if you are like me and your service animal is jumbo sized. They should fit on the floor in front of your seat, so the airline may have to shift you to a seat with more room if your furry helper is plus-sized. Some people worry about traveling via plane with their service animal the first time. Sometimes airports will work with dog trainers to allow service animals to become acclimatized to the airport environment, and even in some instances, to board a plane and become adjusted to the surroundings. But it is difficult to replicate the first air travel, so sometimes you have to overcome your nerves, and take the plunge (plunge in a steep upward direction). Do as much desensitization training as you can before hand, and then relax. Most passengers and stewards/stewardesses will be understanding if your service dog is a little nervous for their first several flights. You can have a sedative for the animal prescribed by your vet beforehand as a last resort, but this is not ideal as the dog cannot then act in its service capacity if it is drugged into sedation. I find with my service dog clients that simply having the prescription on hand just in case makes them feel better even if they never have to resort to using it. Never use a sedative that has not been properly dosed by your veterinarian. Finding a trainer to train your service dog can be another tricky nuance. Some will offer packages with vests and registries and fancy cards. Do your homework. I always lay out the law exactly as it is to my clients. I will provide them with a letter when their dog is sufficiently trained, and always recommend the first step in their training is to pass the American Kennel Club's Canine Good Citizen exam. I will even point them to several places they can register their dog, if that would make them feel better to have that kind of documentation. However there is not a specified service dog training regiment or one central registration agency as of yet. Beware of trainers that do not spell it out exactly as it is or tell you the legal bare minimum. Also, your dog is required by law to be trained in tasks that support you in your disability. The basic sit, stay, come does not cut it. Work with your trainer in laying out tasks that suit your disability. Know that it is a long process to train a service dog. There are lots of organizations out there that provide almost or fully trained service dogs. But many of my clients come to be because they already have a dog which they would like to be trained to be a service animal. Contrary to popular belief, there are loads of dogs that can be trained to be service animals. Just as you can train any dog, you can teach a dog the tasks required to be a service dog. However, there are a few considerations to bear in mind. The first, most obvious is the physical size and strength of your dog. For instance, I trained a toy poodle to be a stroke alert dog. However, she was not big enough to assist her handler in mobility issues, such as steadying her or helping her stand. The second is picking out a dog that suites you. Mostly service dogs are what we would call "bomb-proof." They are calm, well adjusted, usually on the more dominant side of the spectrum in personality, intelligent, and do not have neurotic or nervous issues. It is extremely important to think about personality when selecting dogs to work with the blind, children, or others with certain types of mental disabilities. That being said, it is possible to train a high drive dog to be a service animal for certain disabilities. My German Shepherd Dog is not low energy. In many cases he is not docile. But he is meant to protect me and help me navigate crowds. He also helps me in my dog training business, so he needs loads of drive to learn all the things I want to practice teaching. He is, however, confident and well adjusted which is necessary for any service animal. If you want to train your dog to be a service animal, but they have an inherent personality that is not suitable, you may want to think about getting a different dog for the task. Your dog will thank you for not putting more demands on it that it is capable of handling. The world of the service dog is one in a state of flux. As business owners clash with handlers, and more and more people attempt to pass off fake service animals, the laws are coming more and more under scrutiny. It is a difficult situation both on the side of the handler and the business owner. It is even more difficult for law makers, faced with figuring out how to tighten up the laws without creating a massive, exorbitantly expensive bureaucratic headache. At the end of the day, the situation is still, like many things, at the mercy of the integrity of the population. We shall see where that takes us.